We had a really good turnout for this month’s MHvZ event, which allowed for some good games. 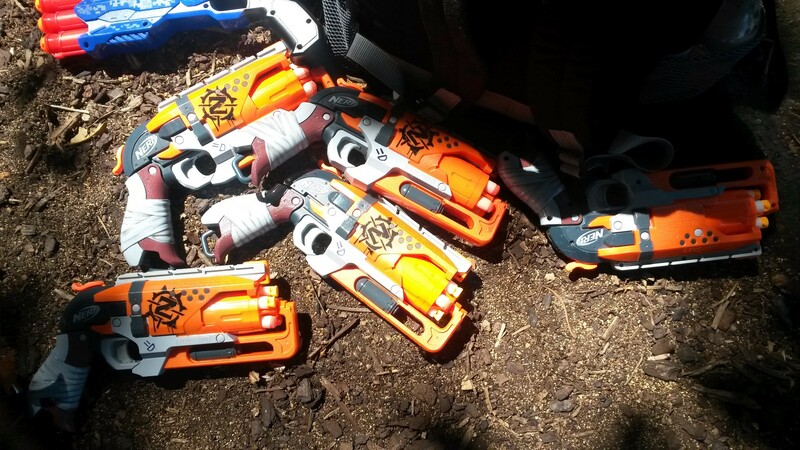 There was also quite a variety of different blasters present at this event. All in-game photos courtesy of Dylan McDylan. 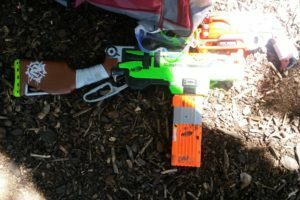 (Regular) Survival – Last human to be tagged wins. Squad Survival – Humans are split into small squads. When hit by a dart, a human must respawn at a tree. 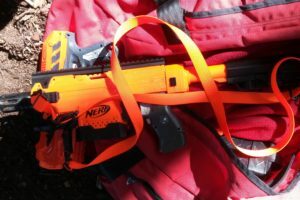 During this time, they cannot shoot, however are still vulnerable to zombies. Humans can respawn three times at a tree, after which another dart hit will turn them into a zombie. The last squad with surviving members wins. Secret VIP/Space Pope – There are 3 special players in this game: the VIP/Space Pope, the General and the Traitor. The VIP is a human who the other humans are trying to protect and is restricted to a given area (we used the usual tambark area), while the Traitor is a zombie masquerading as a human. When stunned, zombies must move outside of the VIP’s area before counting down their stun. The only person who knows the VIP’s identity is the General, while all original zombies know the Traitor’s identity. Everyone knows the identity of the General, making them the only guaranteed trustworthy human. The Traitor acts as a human, but can at any point do a single Traitor zombie tag, revealing that they are the Traitor, and thus turning into a regular zombie. Additionally, if a human hits another human, the hit human is stunned as if they were a zombie, however they can still fire their blaster. If the humans protect the VIP for a given period of time (e.g. 15 minutes), the humans win. If the zombies successfully tag the VIP, the zombies win. Zombie upgrades are unlocked on a timer like Survival, with Infectors available from the start, 5 minutes for Tanks and 10 minutes for Husk. If a human is hit by a grenade, they are instantly turned into a zombie. This is the only way to actively eliminate the Traitor. Bounty Hunt – Two humans are designated as VIPs, known to all players, and allocated a particular zombie upgrade. If a VIP is tagged, their allocated zombie upgrade is made available. The game otherwise operates like a standard Survival round. 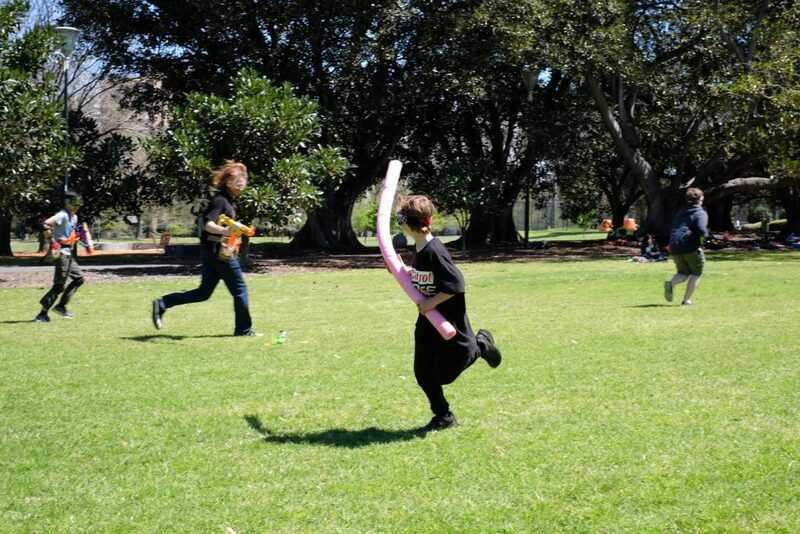 Husk – a zombie gets to use a ranged attack, in this case a Zing bow. A ranged Husk attack counts as a regular zombie tag. The Husk may move from the place they were stunned to retrieve their ammo, but do not count down their stun timer until they return to their original stun place. 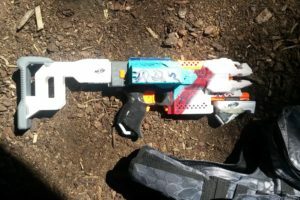 Rapidstrike (various motors, LiPos) – most popular high ROF flywheeler, and my go-to blaster for HvZ. 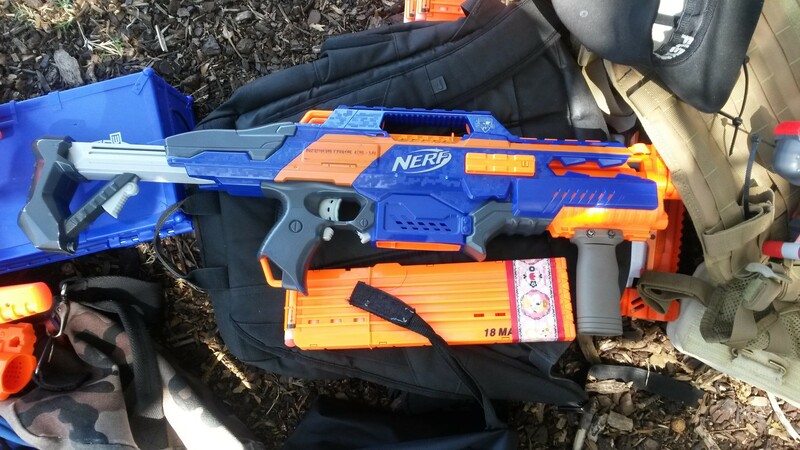 Highly effective against both singular and multiple zombies, but can go through darts very quickly with poor trigger control. 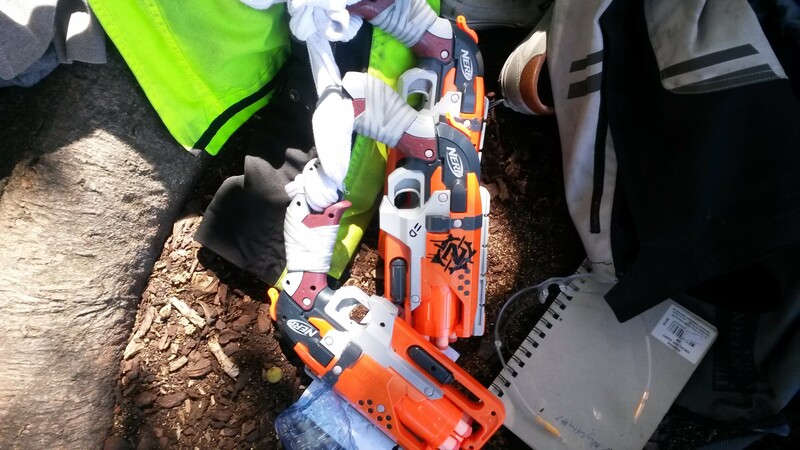 Hammershot (often higher capacity cylinders) – the most popular sidearm at HvZ, a solid, one-handable revolver. Also usable as a primary for a light, scavenger type loadout but the Lawbringer is better suited to that role. 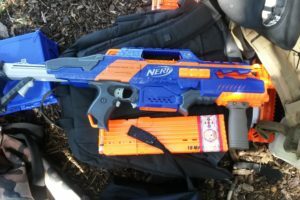 Retaliator/Recon MkII (often pump grips, various springs) – modular and reasonably powerful mag-fed springer, effective for most combat situations though a little vulnerable to massed zombie rushes. 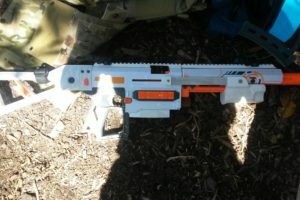 Elite Alpha Trooper (various springs) – out-of-box pump action springer. 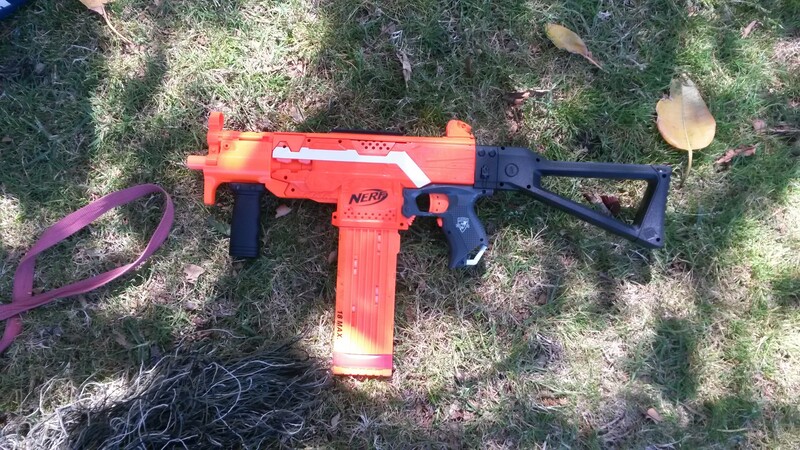 Weaker than a comparable Retaliator/Recon MkII build, but doesn’t require a custom/aftermarket pump grip. 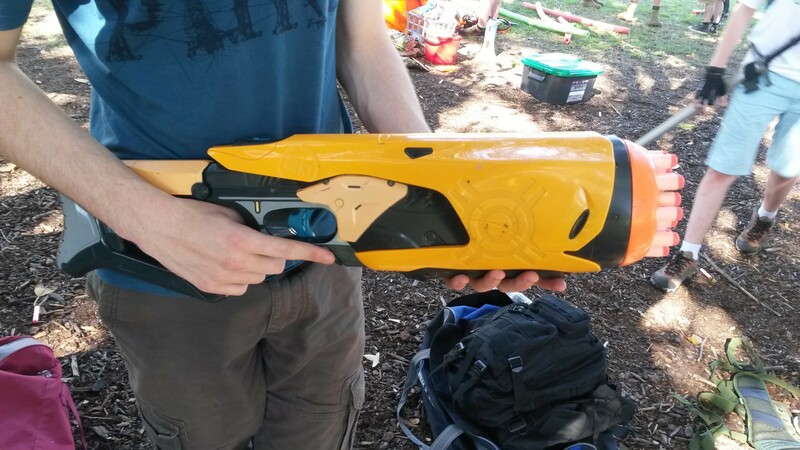 Lawbringer – high capacity one-handable revolver. 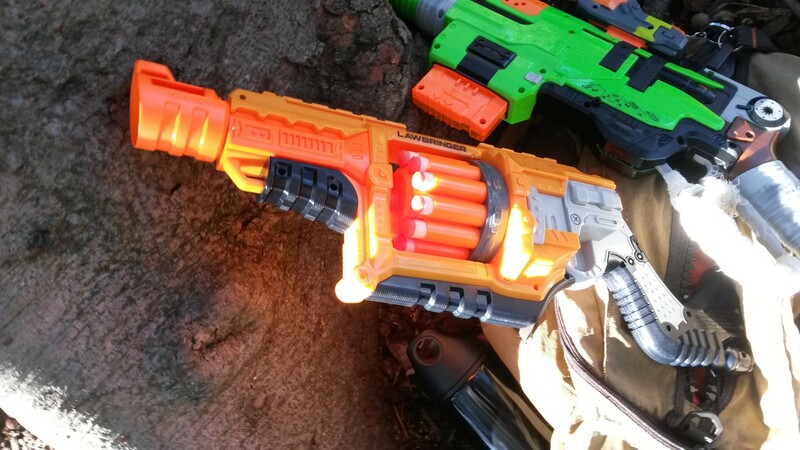 A little too large to be used as a sidearm for most players, but otherwise functions essentially as a high capacity Hammershot. 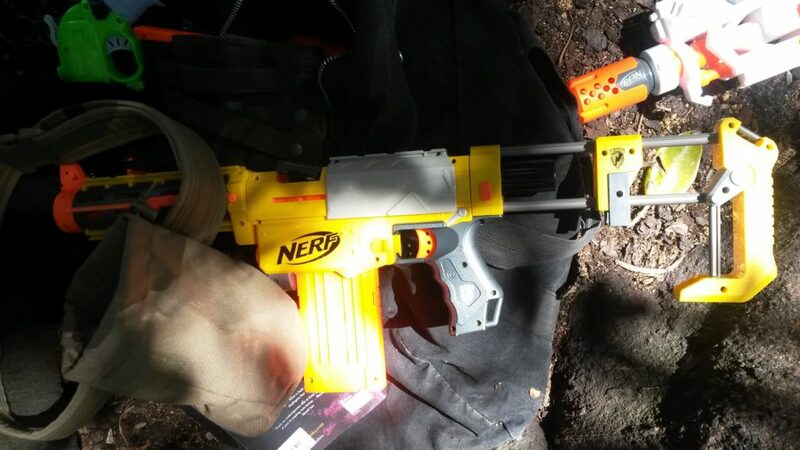 Ideal for a light, scavenger playstyle. 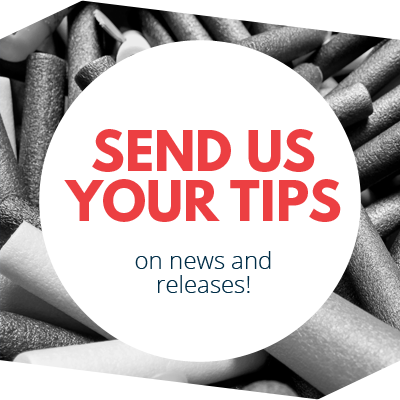 Stryfe (various motors, LiPos) – most popular flywheeler, a great all-rounder modular platform. 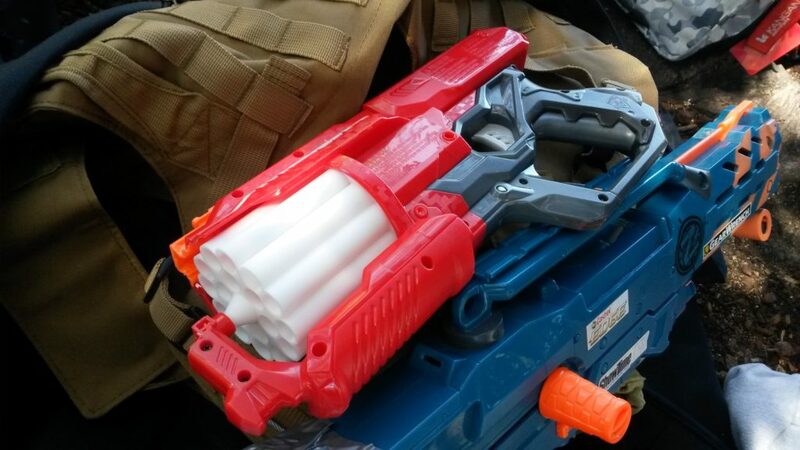 Effective in just about all combat situations, and has a massive variety of aftermarket parts support. 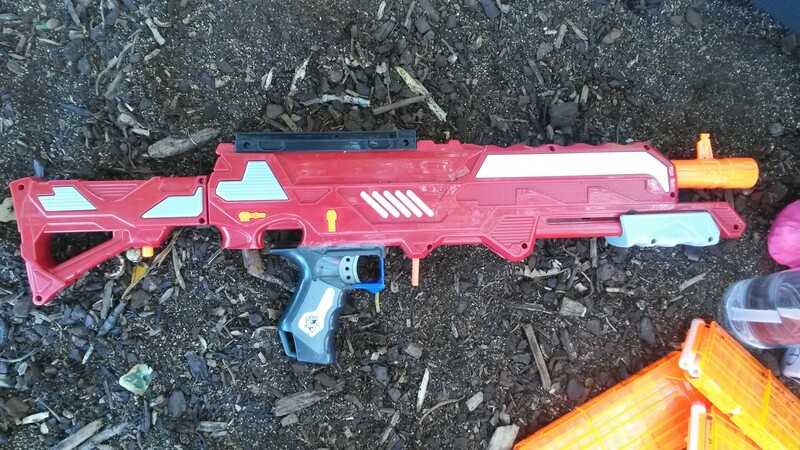 Rotofury (various springs) – reasonably high power revolver rifle, typically used either as an alternative springer to the Retaliator/Recon MkII, or as a decent Mega primary. 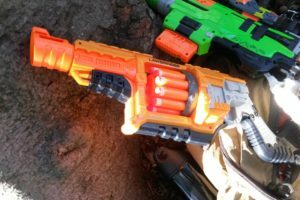 ROF is fairly slow compared to most other popular primaries, and its capacity of 10 darts with no quick reload leaves it quite vulnerable to groups of zombies. 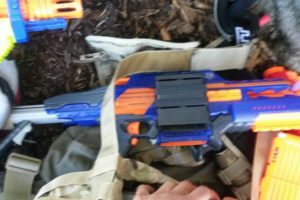 Sledgefire (various upgrades) – typically used as a high power, accurate single shot. In this role it is highly effective at longer ranges for picking off and whittling down zombie groups. It is very vulnerable against multiple zombies in close quarters however. 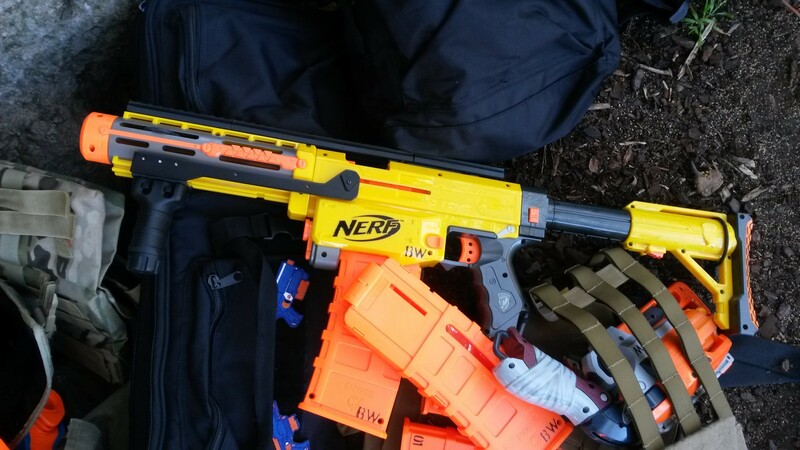 In this event, at least one still utilised stock shells, for a 3-dart burst effective in close quarters, however is still highly vulnerable against multiple zombies. 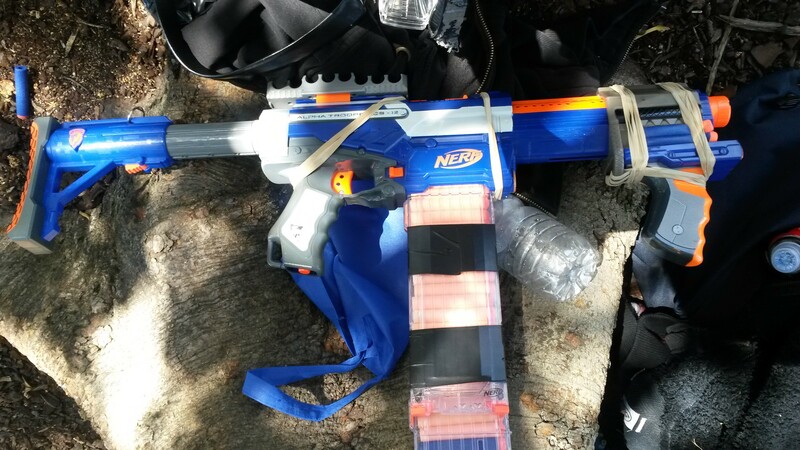 Another Sledgefire was hooked up to a HPA system, and used shells loaded with half-length darts, for a 6 dart burst. The improved spread and still respectable range, coupled with a slightly faster reload (due to not having a spring to prime) offers it a significant advantage against groups of zombies, however it is still quite vulnerable to spread out zombies. 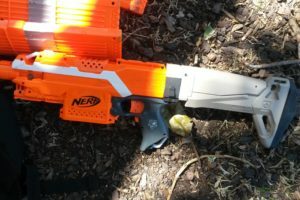 Rayven (various motors, LiPos) – essentially a Stryfe in a different form, with slightly worse performance. 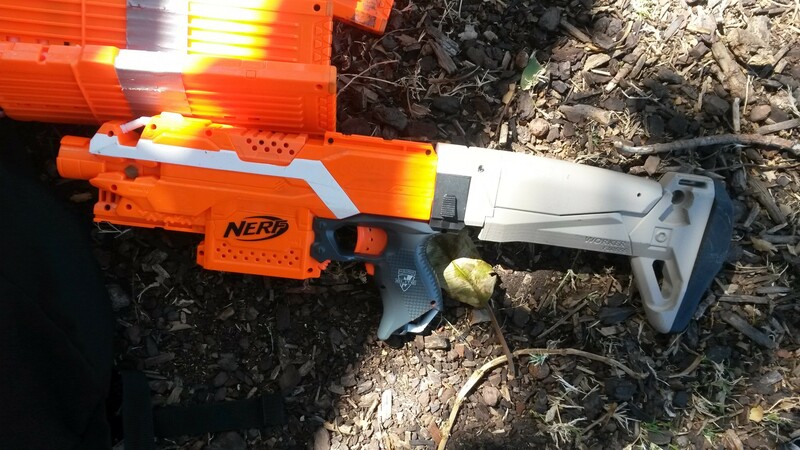 Effective when built well, but has a myriad of extra issues not present in the Stryfe platform. 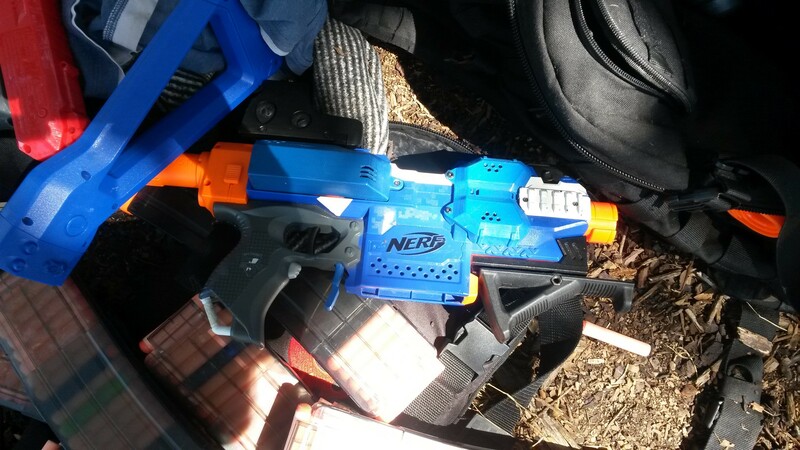 Slingfire (various springs) – a one-handable mag-fed springer roughly comparable in power to an EAT. 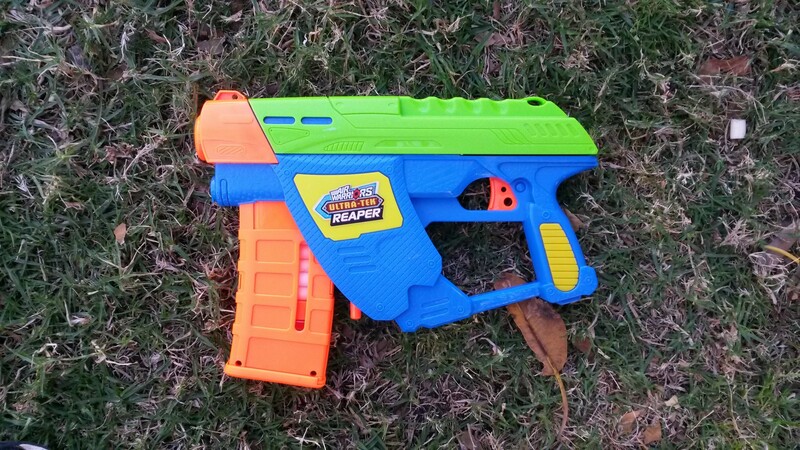 Its one-handability offers it unique advantages over other mag-fed springers, particularly in on-the-run combat and style. 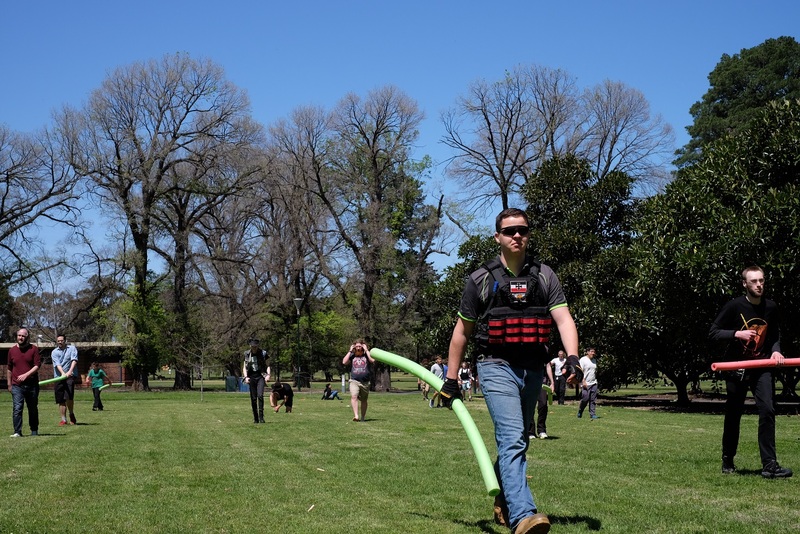 In all other respects however, it is inferior to more conventional mag-fed springers, particularly in the ROF department. 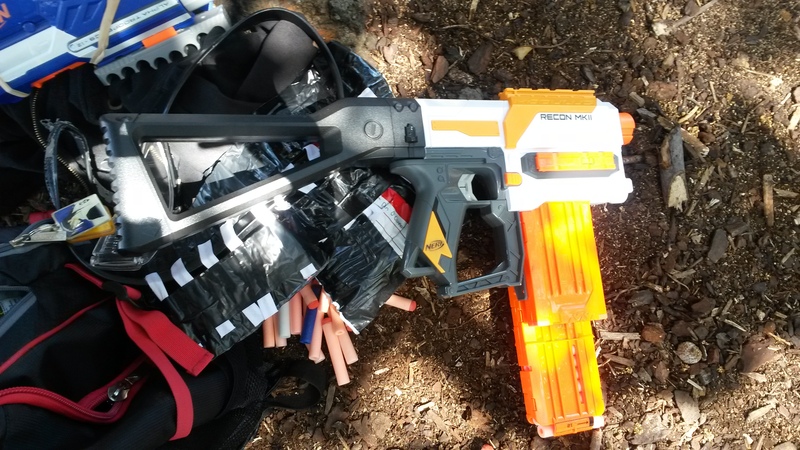 Modulus (various motors, LiPos) – essentially a bulky Stryfe. 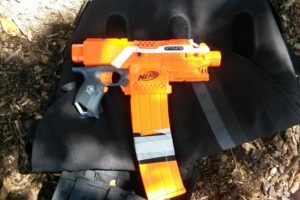 It is also a very effective all-rounder blaster with good modularity, however its large, bulky shell and uncomfortable handle are notable downsides for many prospective users. 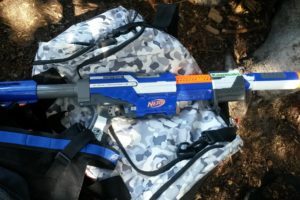 Recon (stock) – I only include this for the ridiculousness of it, and to acknowledge the insanity/bravery of its user. 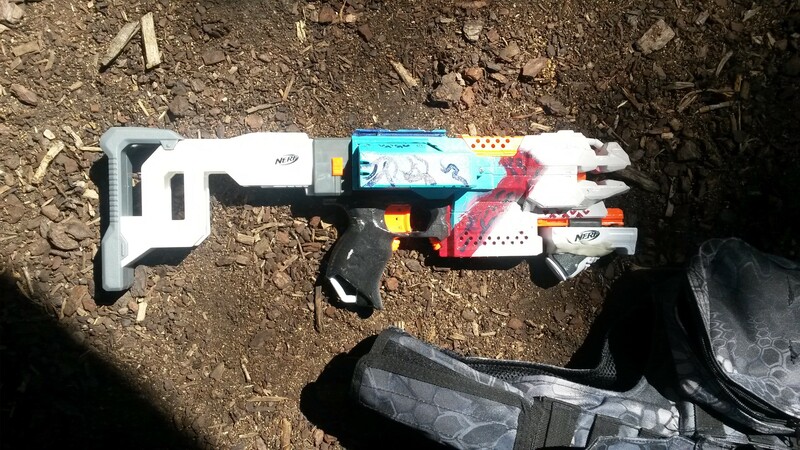 A Retaliator/Recon MkII is directly equivalent or strictly superior in every respect. 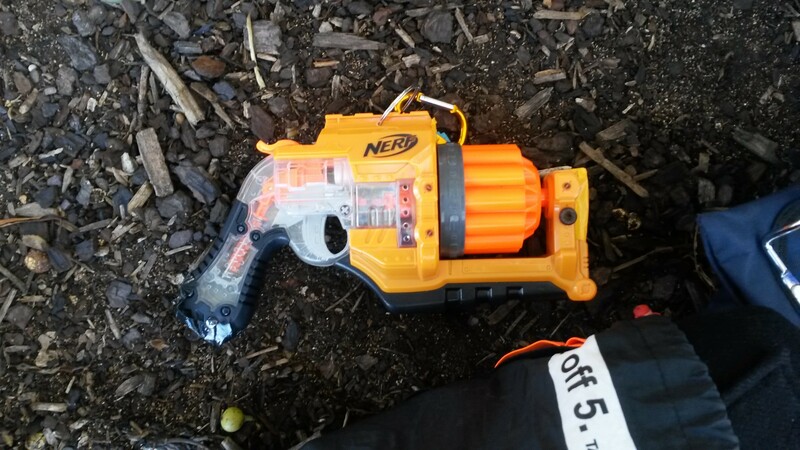 Buzz Bee Thermal Hunter (NerfTurf 10kg spring, handle relocation) – my first combat use of it with its new spring, and after some further tweaking. 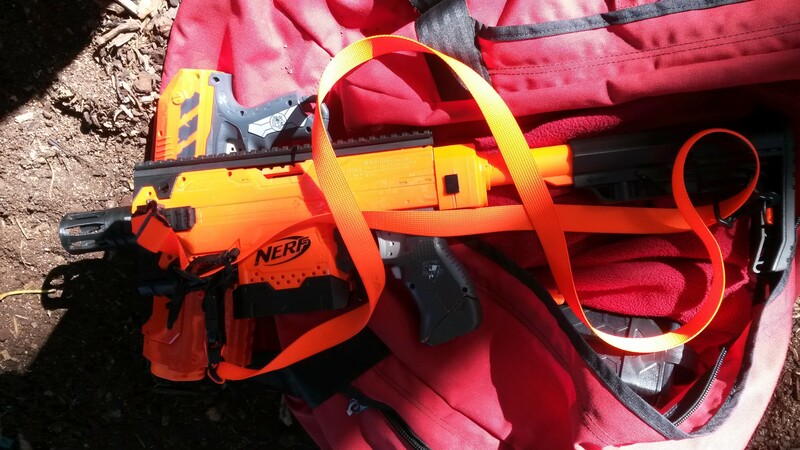 It performed very well, firing darts at good velocity (~110fps) and fairly good accuracy, certainly good enough for me to nail zombies from over 15m away quite consistently. 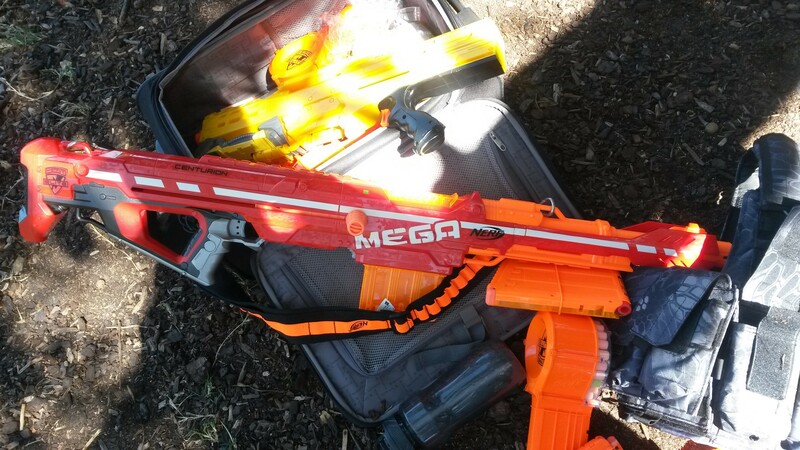 The prime strength was not as bad as I had feared, and for the round I used it, I found it perfectly manageable. 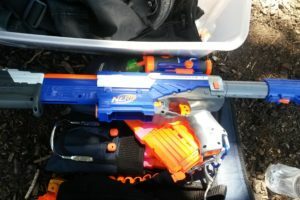 My friend also gave it a shot for a round, and was quite impressed with it, hailing it as being superior to the EAT in both power and ergonomics. 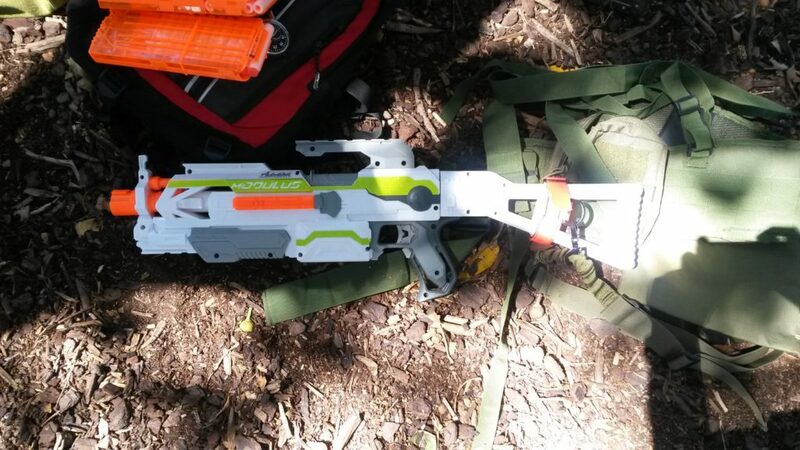 Longshot (unknown mods, if any) – high power springer, typically seen in higher power events. 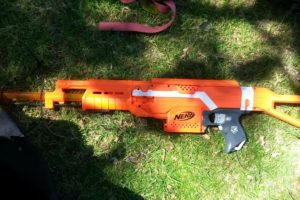 As HvZ’s muzzle velocity limit is 130fps, there is little reason to run a Longshot, which only comes into its own when attempting to attain 150+fps. 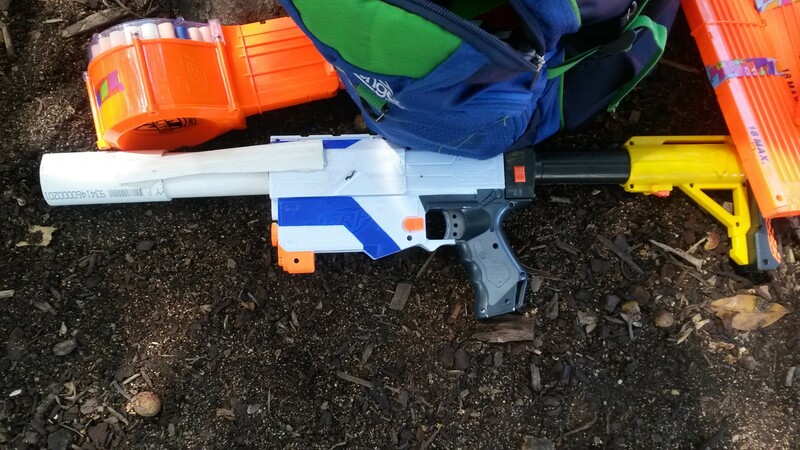 The one used was lightly or not at all modded, making for a bulky and underpowered mag-fed springer. 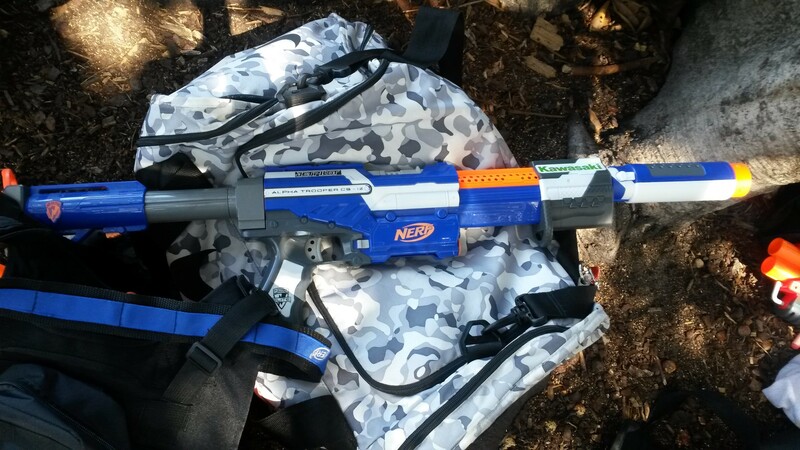 Rapid Fire AS-20 (stock) – a high ROF blaster from well before the flywheeler era, the RF20 is an old air powered, requiring a lot of pumps to fire its full load. 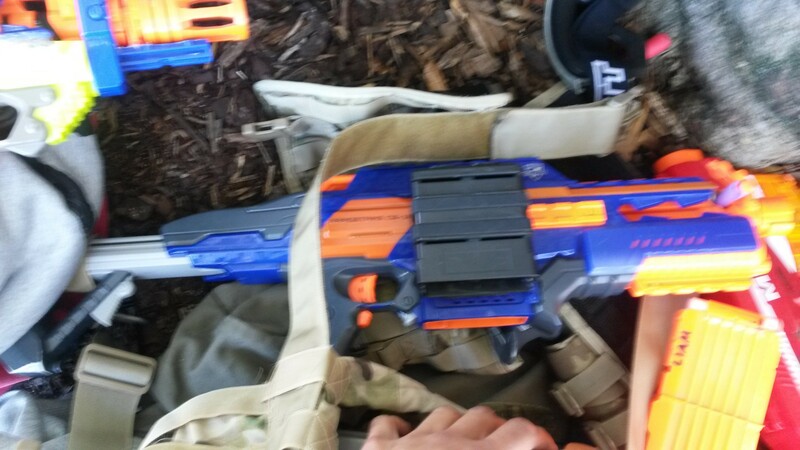 It has a good ROF, especially for a stock blaster, however is lacking in power, takes a very long time to pump up again, and in stock form has no quick-reload system. 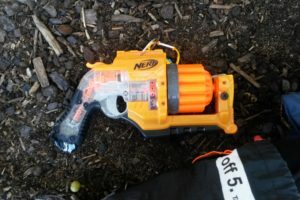 Cycloneshock (shotgun cylinder) – typically seen as a Mega firing blaster, this Cycloneshock instead fired bursts of 3 regular darts. 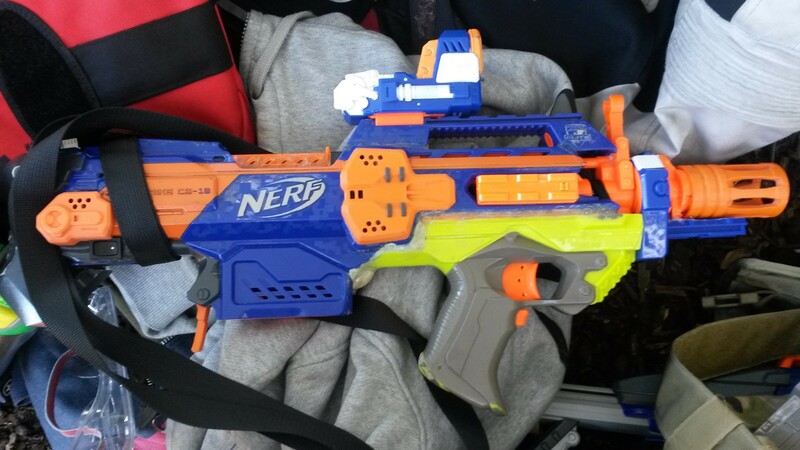 This offers it quite good utility in close quarters, as well as being much more scavenge-friendly. 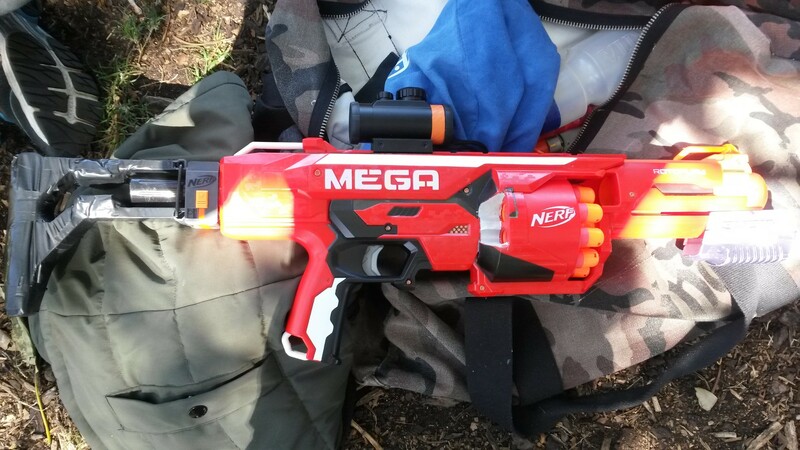 It is still limited to 6 shots however, and takes a while to reload. Centurion (believed stock)- used for no reason besides fun and gags. 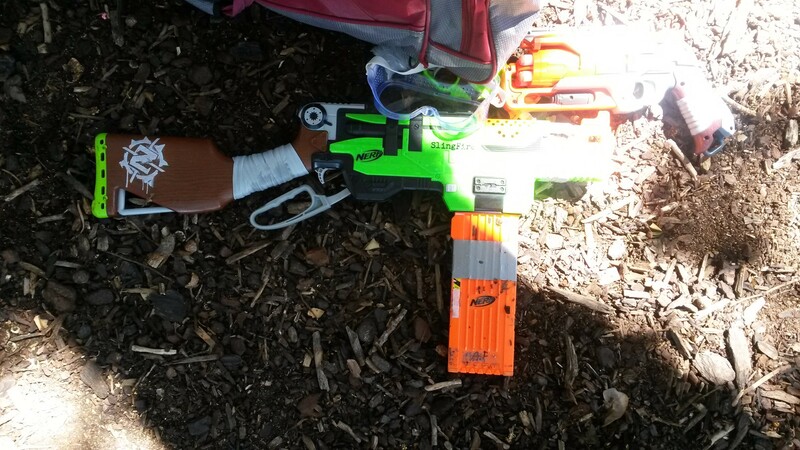 It offers no practical advantage over a Cycloneshock besides quick reloads with spare mags, and is a massive (over 1m long) liability. 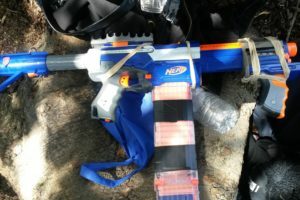 Crossbolt (unknown mods, if any) – a mag-fed stringer blaster, firings darts with a stretched cord rather than air from a plunger or flywheels. 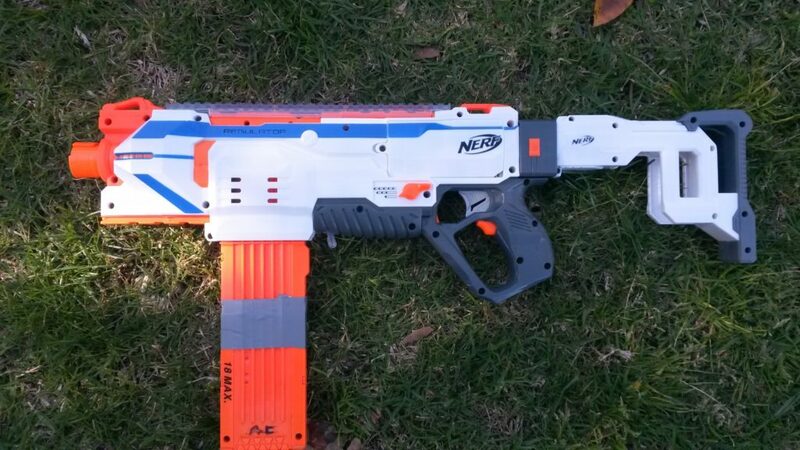 It is extremely quiet, though this is just about its only advantage over more conventional blasters. It is otherwise quite wide due to the bow arms, relatively slow firing, and not especially powerful. 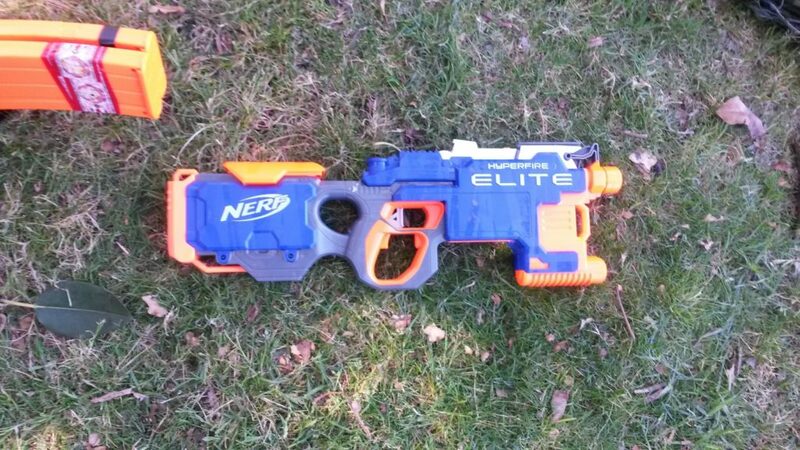 Elite Hyperfire (unknown mods, if any) – a full-auto flywheeler strictly inferior to the Rapidstrike, with a less reliable belt feed and canted flywheels, which do nothing but spin out the Kooshes used at MHvZ. 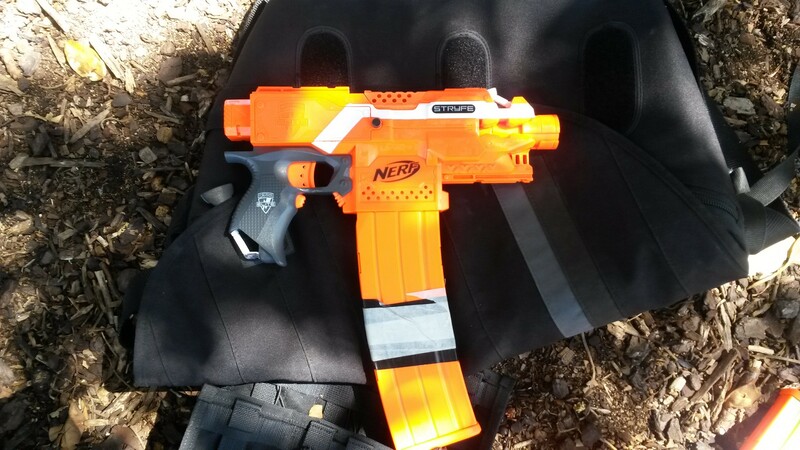 When it works properly however, it is still very effective at closer ranges, roughly comparable to a similar spec Rapidstrike. 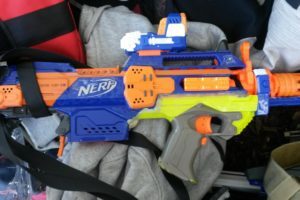 Swarmfire (believed stock) – an older full-auto blaster, notable for its completely open front turret allowing for easy scavenging and reloading on-the-fly. 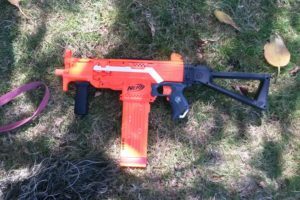 Its ROF is quite slow for a full-auto however, to the point where I would consider its speed more of a liability than an asset. It also takes a fair while to fully reload. 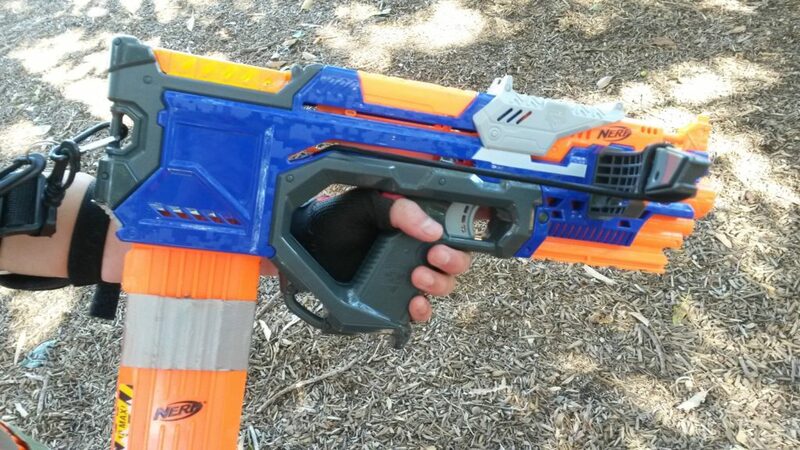 Buzz Bee Reaper (stock Aus-spec) – a basic mag-fed blaster. The one present was stock, and of Australian spec, and so quite weak, however functions just like a base Retaliator of similar spec. 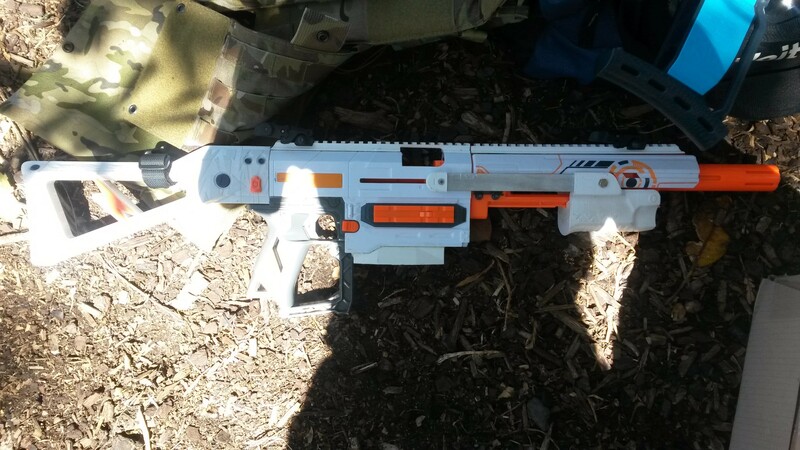 It has the advantage of a large and easy to grip slide, however does not have the out-of-box support for a barrel/pump grip and stock that a Retaliator has. 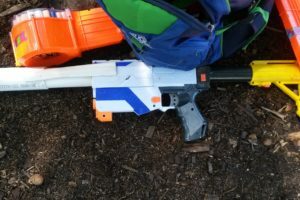 Regulator (rewired, stuck on full-auto) – with the select-fire disabled, functioned essentially like a Hyperfire – a full-auto flywheeler inferior to the Rapidstrike. 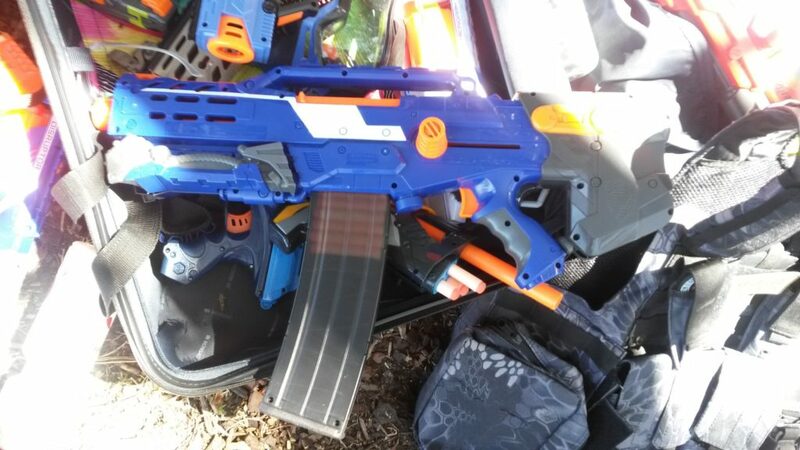 Of note on this unit is its relocated mag release just behind the magwell, which is far superior to the stock one. 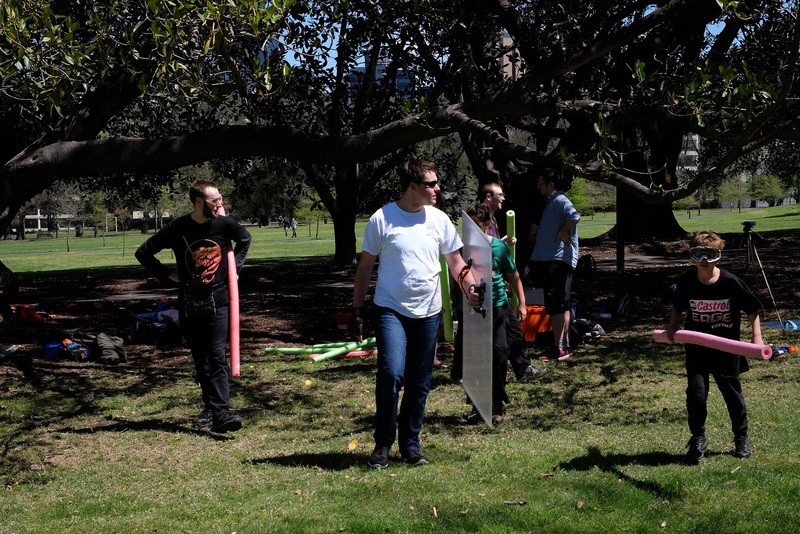 We had quite a good turnout today, peaking at around 45 players. This worked nicely with the weather, which was sunny but cool, not breaking 17 degrees C. All up, we were able to have some really good games. As is pretty much MHvZ tradition, we started with a Survival round. In today’s event, the Survival rounds had all zombie upgrades available from the start. This skips the first ~10-15 minutes of play where the zombies typically achieve very few, if any, tags, and spend most of their time waiting for upgrades. With the Tank shields and Husk in play from the start, most human attention was drawn directly to them. While they were still unable to achieve many tags in the first couple of minutes due to the sheer volume of fire, the humans start off under much more pressure. Additionally, the other zombies are free to pressure the humans from other directions, or look to pick off any stragglers. As intended, the zombies were able to achieve many more tags in early game than the usual timed upgrade Survival. Overall, the game felt much faster paced, and progressed much more quickly than the aforementioned timed upgrade Survival. I was the last survivor in this round, spending most of early and mid game avoiding the main human groups. By sticking in a small group and keeping away from the bulk of the humans, I was able to survive into late game with a relative minimum of combat. 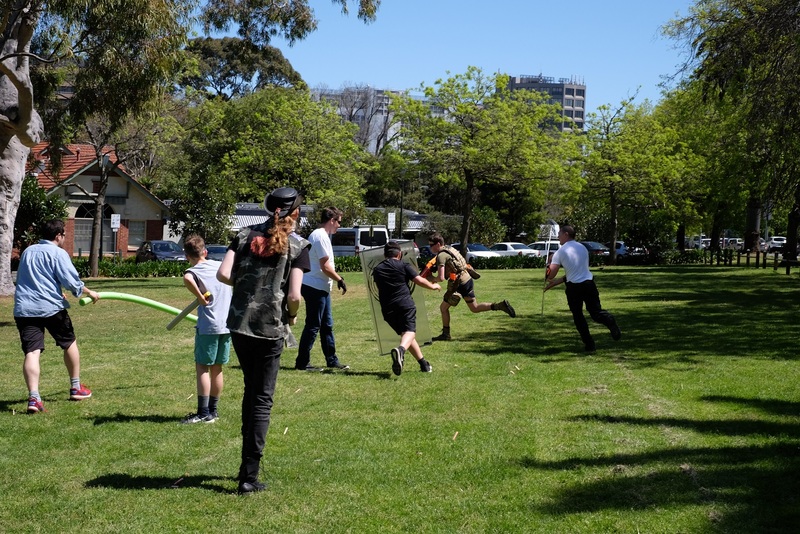 By the time the zombies actively targeted my group, most of the other humans had already been tagged, and I was able to outlast all the other remaining humans. The second round we played was a Squad Survival round. We were split into squads of 4, and once again all zombie upgrades were available from the start. 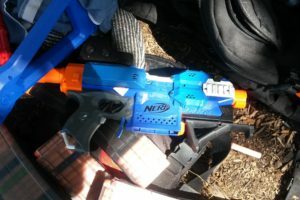 Right from the start, the zombie group targeted my squad, and they were aided by another human squad who fired upon us. Being still exhausted from my last stand in the previous round, I was unwilling to risk my health further by spending the entire round running, and so let myself be tagged early on. 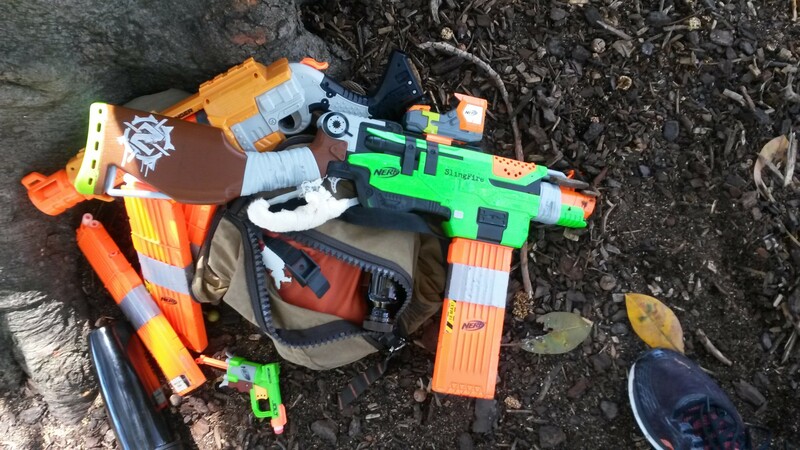 The rest of my squad was tagged shortly afterwards, from a combination of the relentless zombies and their (temporary) human allies. As a zombie, I spent most of my time hounding down the more isolated squads, and in particular any humans who got separated from their squad. 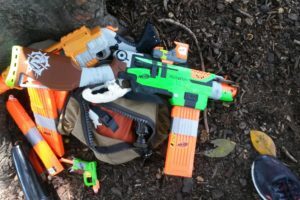 Due to the HvH aspect, human stragglers may not necessarily be able to join another human group to survive, resulting in an easy win-win situation for the zombies to get the tag. 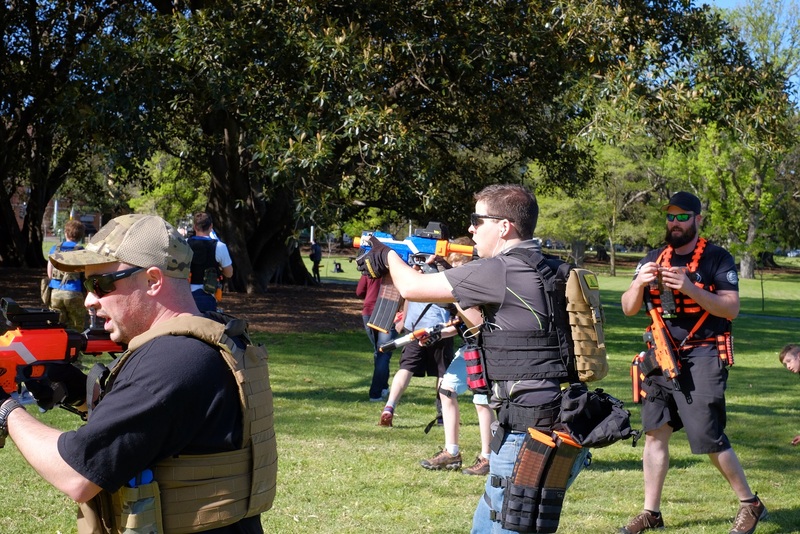 Furthermore, the HvH aspect of the game prevented squads from joining up too willingly, limiting the amount of firepower available to human groups for fending off zombies. 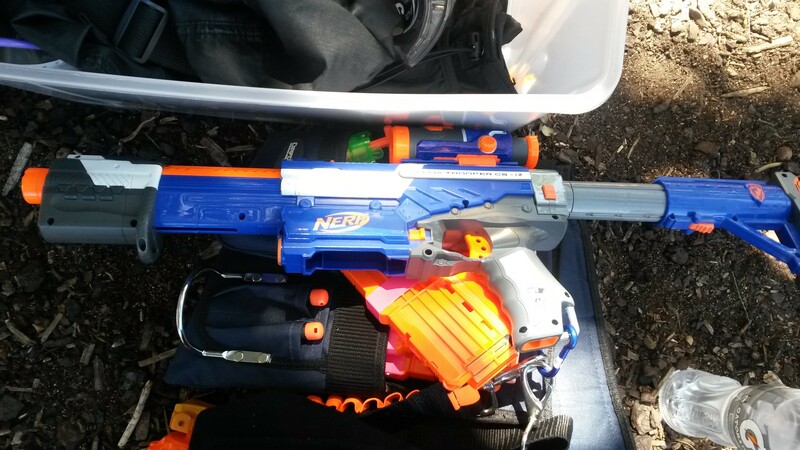 This works entirely to the zombies’ advantage, as they have much less firepower to worry about when charging down human groups. Nearing the end of the round, the survivors were stragglers from various different squads, with the HvH aspect of the game mostly ignored. The game would progress just like a regular Survival round, with the zombies rapidly eating through the survivors’ ammo until they were all tagged. Squad Survival always progresses faster than a comparable Survival round, and typically features a lot more combat and action. Even if the zombies are unupgraded, some human squads will engage in combat, greatly simplifying the zombies’ job. Alternatively, if the zombies have a particular target in mind, certain human squads may be willing to assist them. 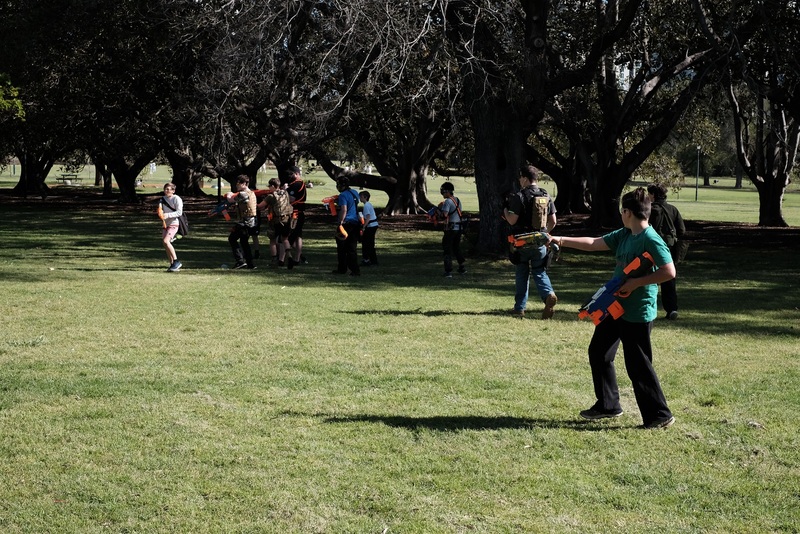 Human vs human combat is entirely beneficial for the zombies, offering many advantages. First up is of course the direct casualties of the skirmish. Any humans who are hit by darts are temporarily helpless against zombies, and can be picked off very easily if not protected. Any humans who are hit enough times also automatically turn into zombies. 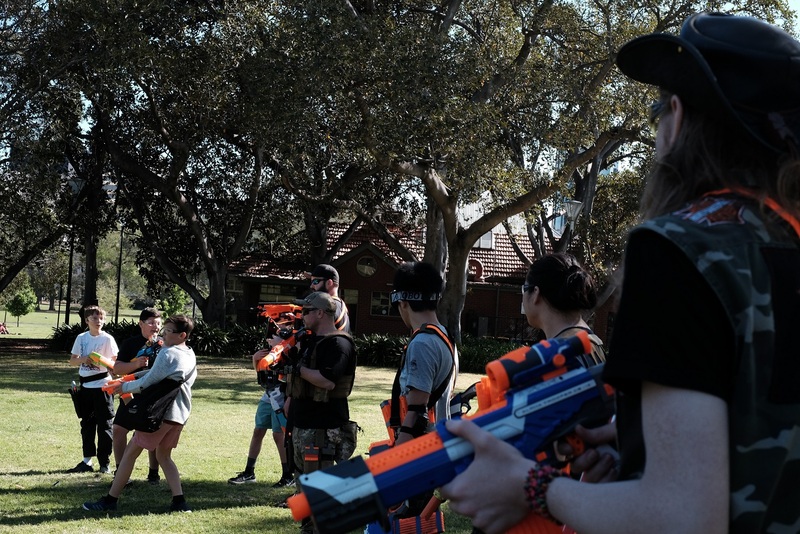 Furthermore, the human vs human combat works as a very effective distraction that the zombies can use to get closer to the humans, potentially snagging a tag or two. Combined with the human combat aspect, it is entirely possible for an entire human squad to be completely wiped out in a single engagement. The HvH aspect also makes it much more difficult for the humans to group up in large numbers. 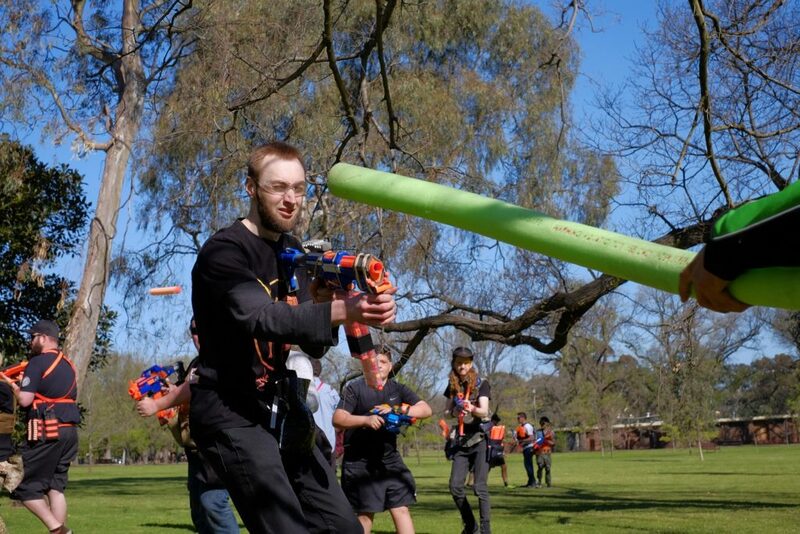 A large human group can easily fend off a large zombie group, even with all upgrades. The sheer volume of fire is more than enough to overwhelm the Tanks, and none of the other zombies can even think of approaching safely. Squad Survival limits the largest human group to around 2-3 squads, as there are typically enough aggressive squads to prevent larger groups from reliably forming. Furthermore, while in regular Survival nearby humans may contribute their firepower to assist, in Squad Survival, human bystanders are actively discouraged from assisting other squads, as it improves their own chances of victory. 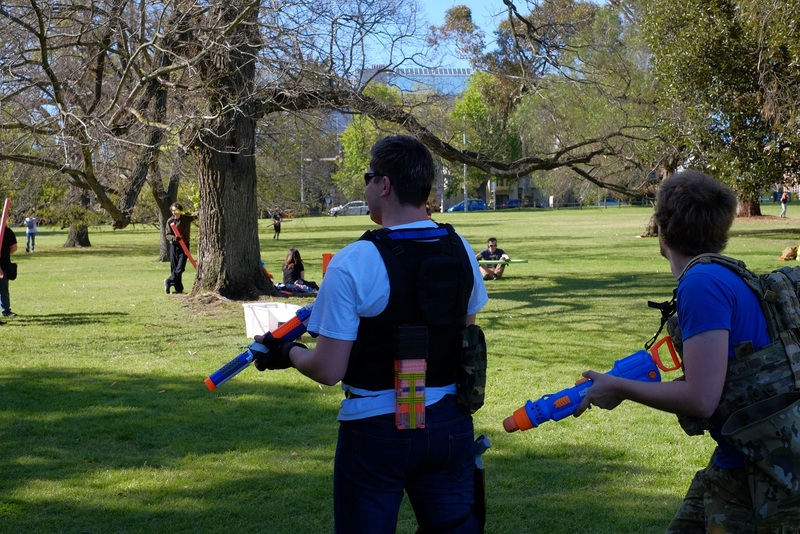 As such, the zombies rarely have to go up against large human groups, which means that even with their limited starting number, they have quite a good chance of achieving some tags throughout the game, not just later on. 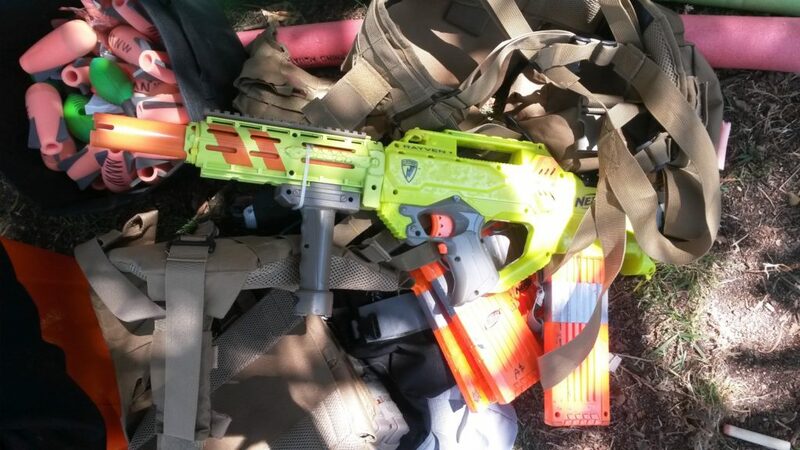 While I personally prefer traditional Survival, as I generally play HvZ for the co-op and non-HvH combat, I have no qualms with Squad Survival being used as a faster finishing, more intense Survival type game. 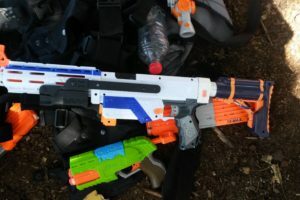 It allows the more aggressively inclined players to engage other humans, without too severely hurting those who prefer to sit back and survive. After the lunch break, we played a couple of rounds of Secret VIP/Space Pope. 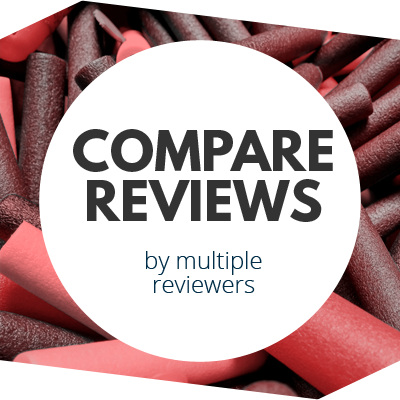 Each of the rounds progressed very differently. The first round started out normally. The zombies didn’t make many tags early on, and the humans generally had an easy time defending. Not too far into the game, some of the humans believed they had identified the Traitor, and proceeded to eliminate them with the grenade. With the Traitor believed to be no longer a threat, the VIP was persuaded to reveal their identity. Unfortunately for the humans, the Traitor was in fact still a human, and promptly took out the VIP immediately after. For the next round, I was selected as the General. I selected a player who I knew could hold their own to be the VIP. We spent most of the time on the edge of the main human-zombie frontline, far enough to not be a primary target but close enough to not appear to be deliberately staying away. This round progressed as standard, the Tanks being the main threat to the humans. While they were able to pressure the humans and achieve a reasonable number of tags, generally speaking the human defences held well and we maintained a decent number towards the late stages of the round. The Traitor chose to act early, attempting to take out two human players before turning. 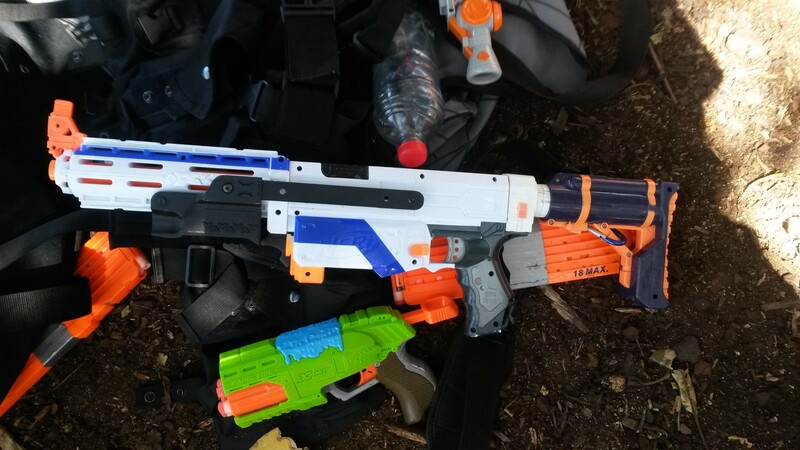 Neither of the humans they targeted were the General (myself) or the VIP, so we were able to maintain a cohesive defence without worrying about sabotage from within. Ultimately, we were able to survive the whole 15 minutes for a human victory. In the third round, the Tanks generally spent their time charging together. With their shields angled outwards, they could make it further into the tambark zone than a lone Tank could. Through sheer volume of fire however, the humans were generally able to fend them off before sustaining significant casualties. 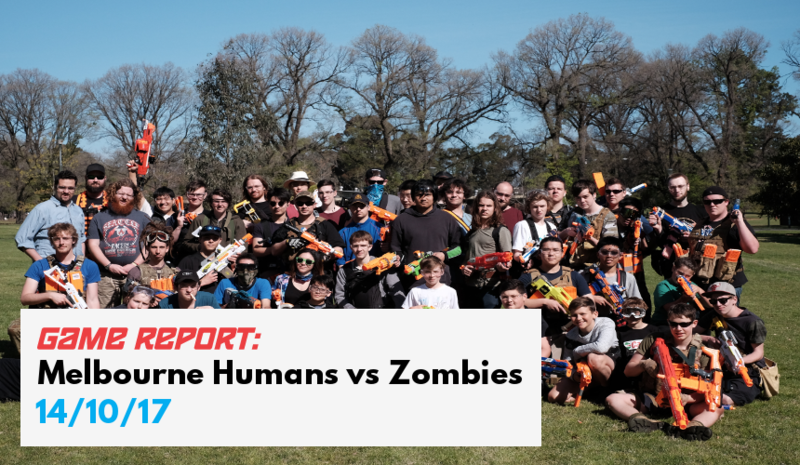 Because both Tanks were in the same area, the majority of humans were also focused in that area, with only a couple of humans needed to watch for the other zombies. The Traitor chose to use their tag on the General, revealing the VIP’s identity to the zombies. 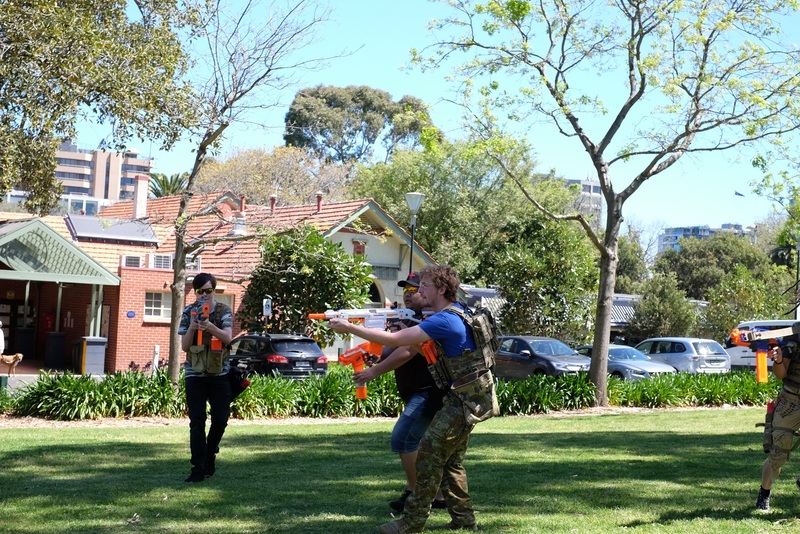 This however proved to be an ineffective move, as even with targeted strikes, the zombies were unable to break through human defences and tag the VIP. With most of the Tank charges being largely ineffectual, the round ended with a resounding human victory. For the final round, the starting zombies were chosen a little differently. Every player who had insufficient ammo for another full round was made a starting zombie, so the starting horde for this round was substantially larger than usual, probably at least a third of the player count. As a result, this game was far more intense for the humans, and there were a lot more human casualties in the earlier stages of the game. Right from the start, there were often multiple zombies charging in from multiple different directions, and relative lack of humans made them far more difficult to fend off. The release of Tank shields made this even worse, with each charge often resulting in at least a few human casualties. I was tagged in one such multi-directional rush, barely stunning a zombie from one direction before another got behind human lines and made several tags, including one on myself. At some point, the General was also tagged. 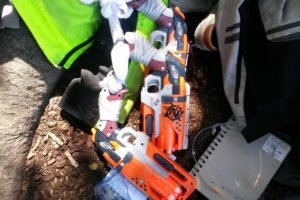 The human group dwindled rapidly, and in a subsequent charge, the VIP was tagged, ending the game with a zombie victory. The Traitor was in fact still in the human group. I find the Traitor strategy of tagging the General, or just the nearest humans, to be generally ineffective and far too luck-based to help significantly. With the Traitor out of the equation, the VIP no longer needs to maintain secrecy of their identity, and the humans can form a more directed defence. Even if the zombies know the identity of the VIP, there is no guarantee that a directed zombie charge or the Husk will be able to tag them. My experience from probably over 15 events of playing this gamemode, has been that the zombies knowing the VIP’s identity is only a particular advantage if the Traitor is still in play, or if the Husk has a good opening. The Traitor is usually far more effective opening fire from within the human group just before a zombie charge. The now-immobility of the humans, coupled with the general chaos and well timed zombie charge, are usually enough for the zombies to snag a good number of tags. If the VIP is not one of those tagged, they are usually left with a small enough human contingent that they could be easily overrun in the next few attacks. The last two rounds demonstrated the value of zombies attacking from multiple directions, especially all at once or in quick succession. It is far easier for humans to fend off many zombies from one direction, than a couple of zombies in all different directions. In the third round, with both Tanks in the same place, it was very easy for some humans to get around them and stun them both, even with additional zombie backup. So long as there were enough humans to bait and overpower the Tanks, the rest of the humans would have an easy time fending off the remainder of the zombies. With the semi-safety of the tambark zone, only a couple of humans are needed to watch the arcs not occupied by the Tanks. Typically, the two Tanks attack from different directions. While this makes the individual Tanks easier to stun, it also causes much more human movement and chaos, which is an ideal situation for other zombies to sneak in and snag a tag or two. 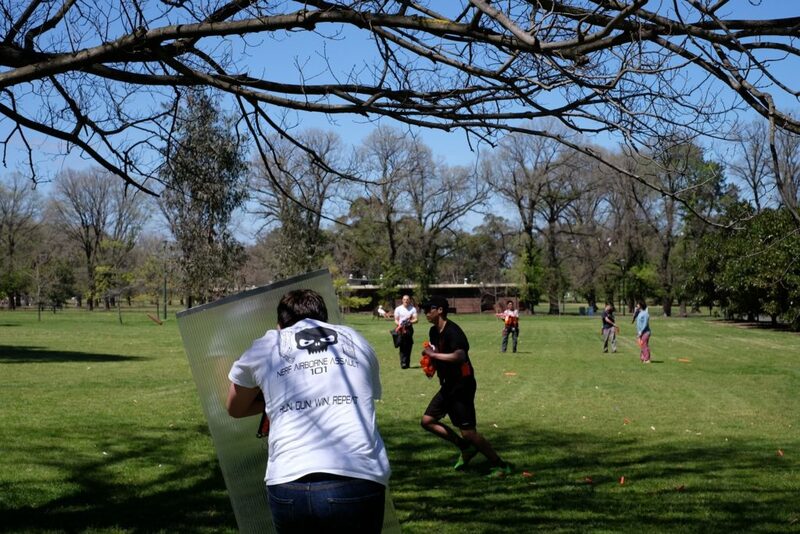 In the last round, the primary distraction was simply zombies attacking from every direction. Late in the game, the humans would be turning back and forth almost constantly to fend off zombies. Inevitably, one of the zombies would charge in from a direction which, at the time, is completely unguarded by the humans. We then played a round of Bounty Hunt. In this round, I was selected as a starter zombie. We started with the Infector upgrade. 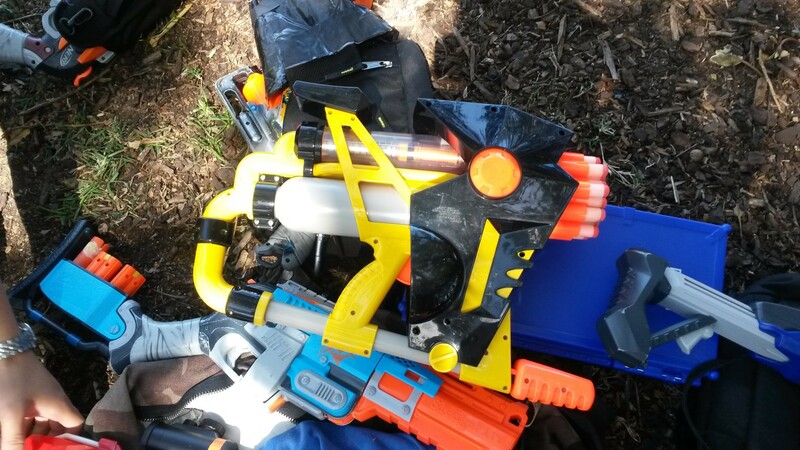 The VIPs were designated by Buzz Bee Blastzookas, and were not allowed to use any other blasters. The humans initially grouped primarily around the Tank VIP, with the Husk VIP left largely unattended, and some smaller groups loitering in the middle. I joined a couple of other zombies in harrassing this middle group. We achieved a couple of tags on some unwary humans, but weren’t able to make a big impact on the group as a whole. When the survivors retreated and merged with the Tank VIP’s group, we linked up with the other zombies, who had managed to tag the Husk VIP. This offered us some ranged support and a neat distraction, and did achieve a couple of tags throughout the round. We moved towards the Tank VIP group in the northwest corner, at which point the majority of the humans moved away. 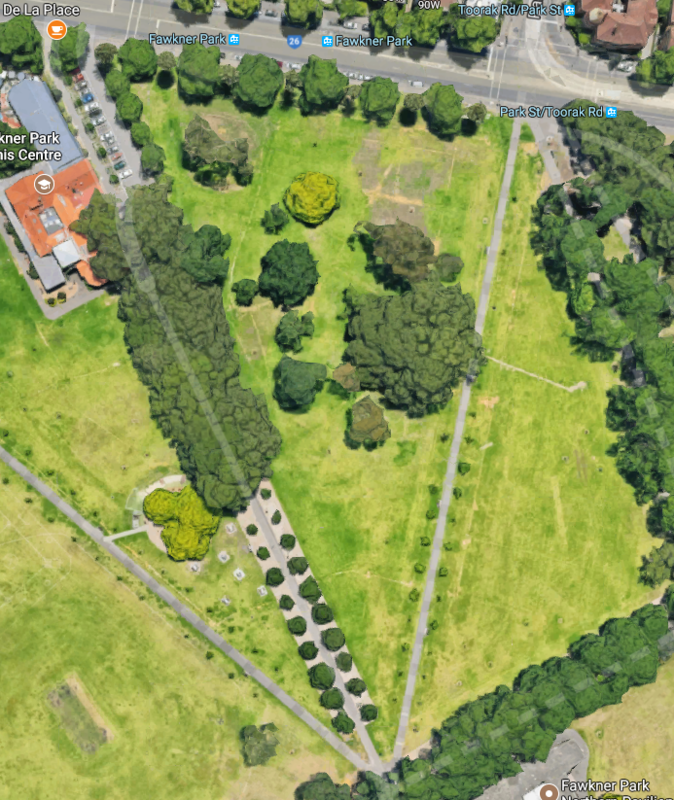 Most went towards the northeast corner, while a couple of humans stayed in the northwest. I moved towards the stragglers, and knowing that I would be unable to make any approach against them, instead assumed a tactical prone sniper zombie position in front of the group. 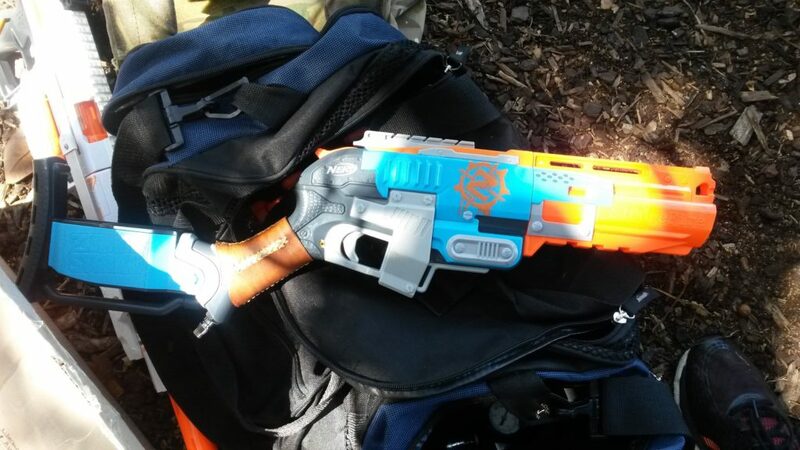 This served as an effective distraction for another zombie to approach the group from behind, and they were able to snag a couple of tags on the humans before they noticed and turned around. 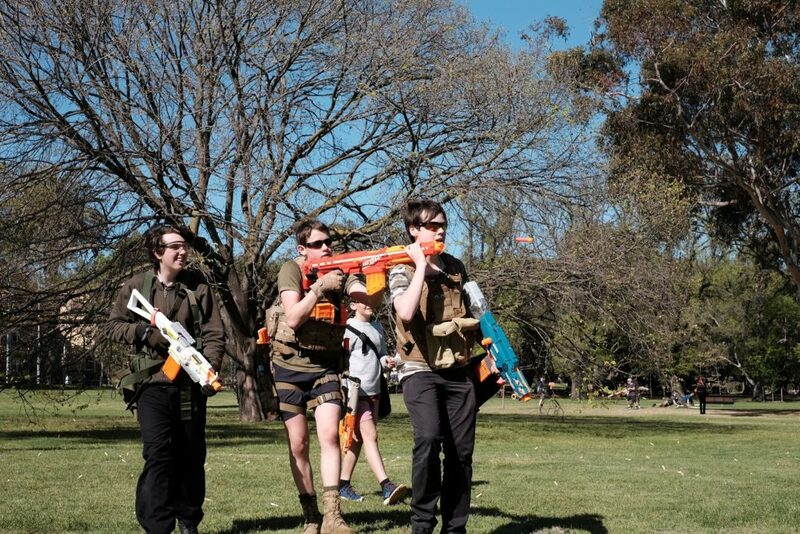 This was pretty much my role as a zombie, as I am not very good at charging recklessly towards well armed humans. 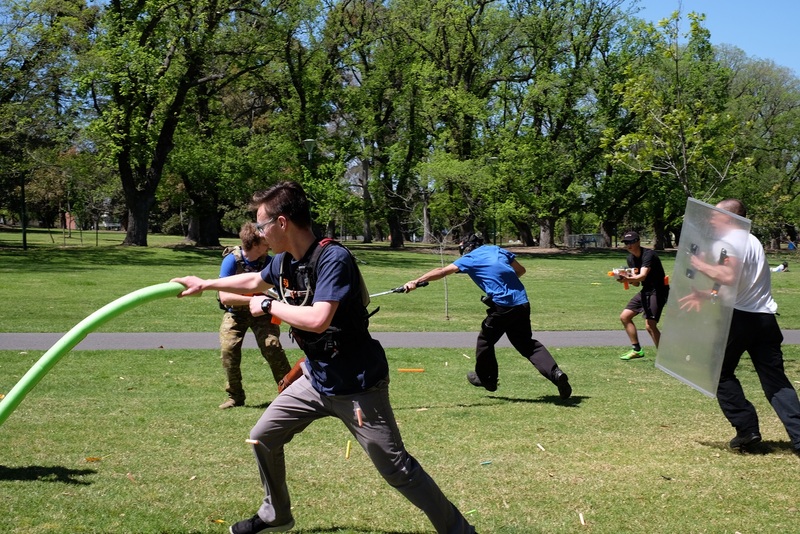 This pattern repeated for much of the game, with most zombies being hosed down mercilessly by darts, but serving as an effective distraction for other zombies to sneak in a tag or two. Eventually, we were able to build up the zombie horde to a good number, even without Tank shields. In fact, the Tank VIP was actually one of the last 5 or so surviving humans. We ended with another Survival round. Once again, all zombie upgrades were available from the start. For the majority of this round, I stuck with a group of 3 other humans. We stayed away from the main human group and generally avoided conflict where possible. This tactic served us well, as we were able to survive well into the late game having fired very few darts. 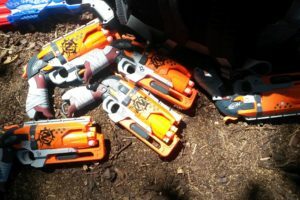 As the now-target of many of the zombies, my group fought through a lot of zombie groups including multiple Tank encounters, and through a combination of firepower, coordination and mobility, we were able to survive many of these unscathed. Inevitably however, we were separated in one particular zombie charge, and picked off. I had a lot of fun at today’s event. 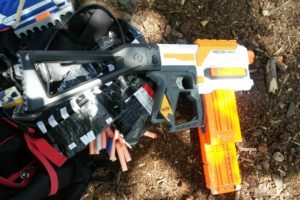 I was pleasantly surprised at the Thermal Hunter’s performance, and am much more inclined to bring it to and use it at future events. This entry was posted in Game Reports on October 21, 2017 by Outback Nerf. 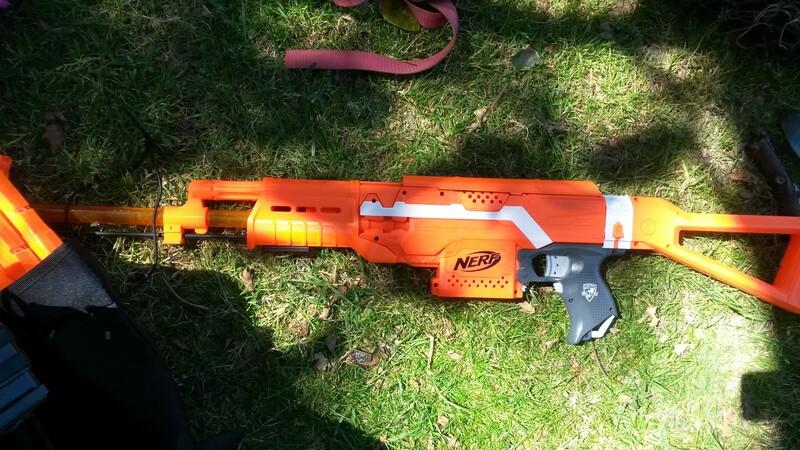 Boomco Halo Blaze of Glory Review Nerf Game Report: October HvZ Madness!